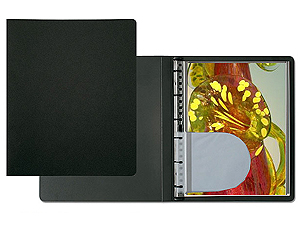 This refillable presentation book for 13x19 photos features a durable polypropylene cover with an easy open low profile spiral mechanism. This semi-rigid black polypropylene cover spiral book is suitable for the presentation and storage of photographs, digital prints and documents. Low profile modular spiral mechanism opens and closes easily to add or replace pages.